This is SCARY #3, the First Ever Fall Special, published in 2014. SOLD OUT! Dr. Van Helsing I Presume? 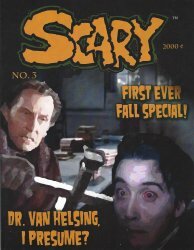 Scary Comics #3 Blood for the Vampire! Perfect-bound, glossy soft-cover book. Color cover and 64 B&W inside pages. Collectors Note: Very few copies left! Each copy is new, uncirculated and picked directly from the printer's shipping carton.